Anime-zing Funtime Blog: 2011 Anime-versary in Review! So here we are, the final entry. It won't be anything long or complicated, but just some things I noticed this week that I dedicated to anime. This year's theme was "Outside your comfort zone" with new additions of Evangelion and Fullmetal Alchemist: Brotherhood. They are not the typical kinds of anime that I watch. Usually I stick more along the lines of the first few on the list. Comedy series or romantic comedies. That is my vice. 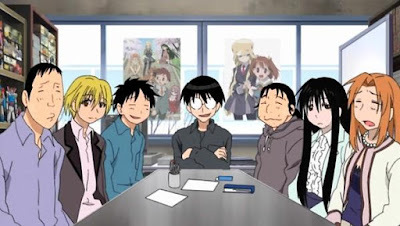 Genshiken I have seen before, but it is a series I appreciate more and more the further I get into anime fandom. The comedy is hit and miss, but I appreciate the slice-of-life parts of the show that make the characters shine. I will have to do a proper review of the series sometime. Evangelion was about what I expected as far as mecha anime goes, but it did a good enough job that I will go ahead and watch the other movies as they come out. I haven't changed my mind about mecha anime, or ones heavily mecha-based, but I can appreciate some of the underlying themes and characterizations that the series is trying to present. Some call it emo, I call it steampunk! 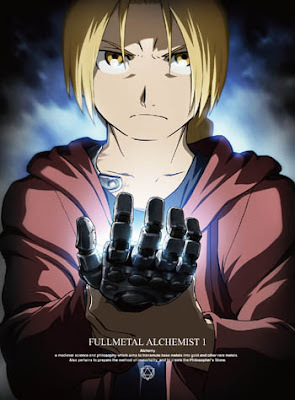 Fullmetal Alchemist: Brotherhood would probably be the surprise of the week as far as I'm concerned. I saw the original Fullmetal Alchemist and was not too impressed. Some parts of it was good, but some of it seemed odd, and now I know why. The parts I found weird were deviated from the manga, not that I've read it. This is an example of a series that should NOT have deviated from the manga. Brotherhood surpassed the original by far in my opinion. I actually found myself compelled to watch one episode after another, unlike the previous series which took me at least three separate occasions to finish. As I said, I spent most of the week going outside my comfort zone and I found that some of it is actually quite fun! There are series I know I could never get into, but I will try harder to not let my preconceived notions hinder me from at least trying a series out or research into it. I will try to do this more as time goes on. I may be taking some time off from anime after this, but this week was a ton of fun! So that concludes the anime-versary 2011 festivities on here. So now we go back to our regularly scheduled programming, possibly in progress.